With the recent updates to Linnworks pricing, customers can save 15% by paying annually rather than monthly. This option has been very popular for a number of our customers but we understand that not everyone wants to make a big upfront payment. Now, thanks to our partnership with our good friends at iwoca, there is an innovative new way for limited companies to save up to 35% on the monthly rates! Choose an annual Linnworks contract and pay monthly with iwoca to save over 15% on the normal monthly rates. Pay faster to save up to 35% (discount if you pay the full subscription up front). It's up to you when you pay, so long as you make the minimum monthly payments. If you have any questions about the flexible payment plan, call one of the friendly iwoca account managers on 020 3397 3375. Login to your Linnworks account at http://acc.linnworks.com. 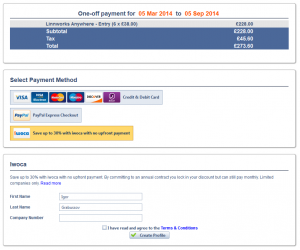 Select the 'Billing and Payments' option. Select the 'Change Plan' button to reveal your available subscription options. Select a plan type and payment option - Choose from 1, 6 or 12 month subscriptions. The iwoca flexible payment plan is available for 12 month subscriptions. iwoca have been helping online sellers get access to fast, flexible financing since March 2012 (with a feedback rating of 9.7/10 on TrustPilot). Now, provided you are a limited company, they can help your business get access to Linnworks for less! * iwoca flexible payment option is only available to limited companies, subject to approval. Eligibility will be assessed automatically at the point of application. Percentage saving is based on the term of repayments. The longer the term of repayment, the lower the overall saving. If you apply for iwoca's flexible payment plan, you are responsible under iwoca's standard terms for repayment. Linn Systems Ltd are paid by iwoca for the agreed term, and are not party to the agreement. Any disputes or queries over payment are between the customer and iwoca.